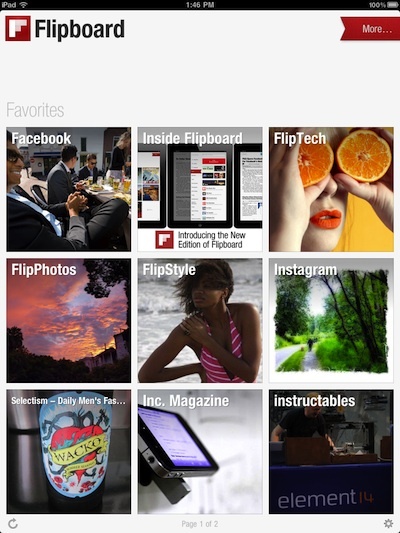 Anyone who has spent much time with an iPad has heard of Flipboard. 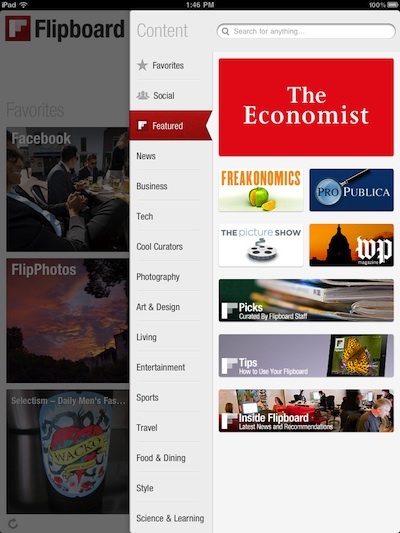 The app was one of the first to rethink the way we interact with news feeds through our iPads. The free Flipboard app supports pulling news, articles and images from what seems like an endless list of sources and presents them so you can sweep through with your finger. Today we were sent an update notice that has many welcome improvements we didn’t know we needed. There’s a universe of beautiful, interesting content available via Flipboard. Tap the ever-present red ribbon in the top right and the new Content Guide slides out, where you can search for any person, topic or blog you’re interested in, or simply browse recommended sections arranged by category. Tap Social to connect to Facebook, Twitter, Google Reader, Instagram, Flickr and now LinkedIn (more on that in a bit), and transform your feeds from those networks into a magazine. Find a source you like, and save it to your Favorites for quick access later. 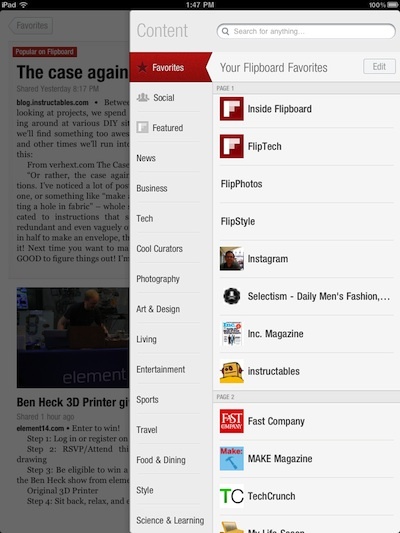 iGoiPad: Choosing the Flipboard ribbon gives you the usual ‘Featured’ list, vertical now so there are more. As well, quick access to the list of other site feeds already set up via the tab buttons on the left. The No. 1 request we heard from our community was the ability to save more content. So now, whenever you’re flipping through a section that you love, you can save it as a Favorite on your Flipboard by tapping the blue “add” button in the upper left. You can see up to two pages of Favorites as tiles on your Flipboard and you can see the rest in the Content Guide. Just tap the “edit” button to arrange your Favorites however you’d like. 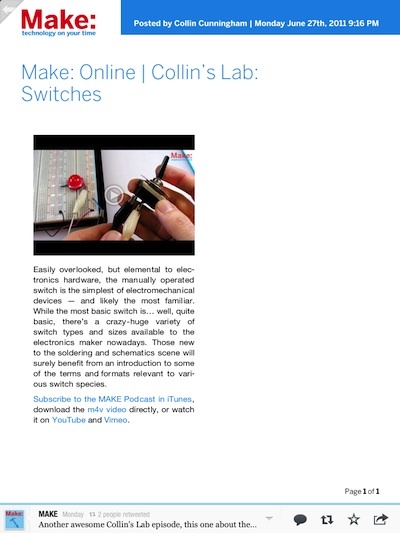 iGoiPad: Via the little ribbon, now on every page including within articles, is access to the ‘Featured’ list. Here is the Favorites list access too so you can jump right to one of those feeds to read rather than backing out to the Flipboard home page and drill back in. We now highlight popular stories in each section based on how often readers interact with them. You’ll likely see the red “Popular on Flipboard” label sprinkled throughout Flipboard, and we’ll also feature these collections in categories like Art & Design and Living. Log in to your LinkedIn account via Flipboard to turn the updates being shared by the people in your professional network into a magazine. LinkedIn also aggregates the top shared and timely news across more than 30 professional industries (you can find the full list in the Industry News folder), and will automatically surface the three industry sections most relevant to you based on your LinkedIn profile. We’ve streamlined the way you read articles in Flipboard. With just one tap, you go straight to a full-screen view of, say, a slideshow from National Geographic. From there you can keep on flipping to the next article as if you were reading a print magazine (as opposed to having to tap in and out of each article). iGoiPad: We have noticed that the speed that Flipboard moves between pages and opening area is considerably faster now. Another frequent request from our community is support for Read Later services. To set them up, tap on the gear (settings) icon in the lower right corner of your Flipboard and supply your login credentials for Instapaper and/or Read It Later. iGoiPad: Depending on the article and if it has been tweeted through Flipboard, the page layout has more information as well more button options for quick access to sharing a article you like with others.